Wendy Brandes, purveyor of all things fabulous, recently posted about her new Minx manicure and pedicure. 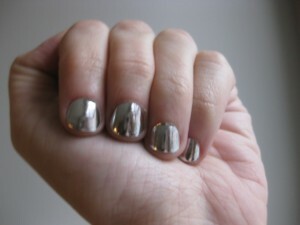 Her new chrome nails are totally fantastic and I can't wait to hear how they hold up over the next week. Do you think she can see her reflection in her nails like a mirror? Sadly there's not enough of a reflection for me to check my lipstick in my nail polish! That would have been...er...handy.